Rise to the challenge the advert said. In big bold letters. It made inviting reading, ‘...you’ll engage in life faster and better than most people of your age... you’ll experience things that you never thought possible and go to places that most people only dream about. You’ll learn your capabilities, sharpen your skills, and then push yourself to the limit on a daily basis. You’ll grow stronger physically, mentally and feel a sense of pride that you’ve never felt before...’ Intrueging eh? The and was for...? The US army. Friends this morning’s reading from the account of Jesus’ life by John, also speaks in the same sort of way of an exciting and engaging life lived richly, diversely, faithfully, divinely and fully. 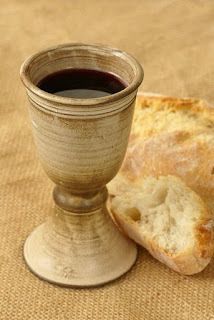 Jesus talks about needing to eat his flesh and drink his blood and this providing life. Now to us this sounds rather disgusting. To Jesus’ good Jewish hearers too this would have been deeply offensive. The book of Leviticus in the Old testament is very clear about what can and cannot be eaten by Jewish people. Only the meat of ‘clean’ animals can be eaten by the God-fearing, but blood can never ever be consumed because the life of the animal is contained in the blood. Talk of eating human flesh and drinking human blood will have taken all of this to a new level. Jesus says, if you find the prospect of eating flesh and blood offensive or difficult try imagining seeing him ascending back to heaven where he was before with God his father. Following Jesus is going to turn our expectations of faith on their head, and to their limit. Jesus is well aware that his teaching can be hard and is clearly turning people off, but what is Jesus actually offering here? Those who eat and drink Jesus are people who find themselves so completely at one with him, that living the way asks is second nature. Jesus says, if you eat and drink me, I will abide in you. I will be with you always, I will be close by, I will be almost within you. We’ll never be left in any doubt what Jesus would do in any given situation in our complex modern world if he abides in us - we will know him and his hopes and dreams for us so well. But Jesus isn’t offering just to be some sort of moral compass - should I do this or that? - he offers us ‘life with God.’ Now I am pretty sure that this will not help us ‘engage in life faster than most people of our age’ as the US army promises us. My life moves fast enough thanks. God does offer us a life better than the one we are currently living. It’s not a new improved version of what we are living, only with more time for reading the bible and praying and not financial worries. No, it’s actually an old version of life, and old vision of life, life with God the way He always intended it to be lived. What does a life with God look like? It is one that acknowledges what Peter does in this morning’s reading - Jesus has the words of eternal life. Throughout the big story of the Bible, God has said again and again ‘I am with you, are you with me?’ God says this supremely in Jesus. But he doesn’t just say it, he shows us what it means and what it looks like. A life with God is lived by someone who relies totally and exclusively on Him. Not just for food, or protection, or good exam results, or the things we thing we want, but for everything. A life with God is lived by someone who listens to what God says - in the quietness of our own prayers and in what is said to us by God through the pages of the Bible. A life with God is lived by someone who expects their life to change. None of us like change much but if we listen to and live Jesus’ ‘words of eternal life’ we wont just change, rather we will see our lives utterly transformed, completely changed, by God so that we will no longer try to live as Jesus asks us, we will just live it - doing the seemingly impossible - loving our neighbour, loving God, forgiving those who wrong us, and so on. Ella, this is eternal life. This is life with God. Together as we listen to Jesus, God promises continue to utterly transform us - completely changing our lives for the better - not offering us something new, but rather something old - lives lived fully, richly, and divinely with him the way he intends. Amen.